482 pages | 150 B/W Illus. A skyrmion is a tiny region of reversed magnetization – quasiparticles since they are not present except in a magnetic state, and also give rise to physics that cannot be described by Maxwell’s equations. These particles are fascinating subjects for theoretical and experimental studies. 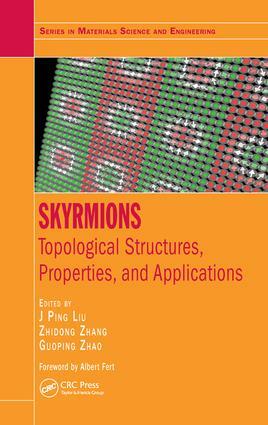 Moreover, as a new type of magnetic domain structure with special topological structures, skyrmions feature outstanding magnetic and transport properties and may well have applications in data storage and other advanced spintronic devices, as readers will see in this book. Chapters address the relationships between physical properties of condensed matter, such as the AB effect, Berry phase effect, quantum Hall effect, and topological insulators. Overall, it provides a timely introduction to the fundamental aspects and possible applications of magnetic skyrmions to an interdisciplinary audience from condensed matter physics, chemistry, and materials science. "The book reviews all the aspects of recent developments in research on skyrmions, from the presentation of the observation and characterization techniques to the description of physical properties and expected applications. It will be of great use for all scientists working in this field." "this is the first book that covers the concepts and features of magnetic skyrmions in such a systematic and comprehensive manner…. This publication is suitable for readers who are interested in condensed-matter physics, especially magnetism and electronics, both at an undergraduate and postgraduate level. It also can provide good guidance to those starting research on magnetic skyrmions." Imaging and Tailoring Chiral Spin Textures Using Spin-Polarized Electron Microscopy. Novel Topological Resonant Excitations of Coupled Skyrmions. Skyrmion Stability in Magnetic Nanostructures. Magnetic Skyrmion Channels: Guided Motion in Potential Wells. J. Ping Liu received his Ph.D. in Applied Physics at the Van Der Waals – Zeeman Institute, the University of Amsterdam, the Netherlands. He is currently a Distinguished Professor in the Department of Physics at the University of Texas at Arlington, USA and an Adjunct Professor at the Ningbo Institute of Materials Technology and Engineering, China. He is a Fellow of American Physical Society. His current research work is focused on nanostrucutred magnetic materials. He has organized and led several joint research programs in nanocomposite magnets supported by federal agencies including DOD/DARPA and DOD/MURI. He has authored or coauthored more than 220 peer-reviewed publications, including review articles, book chapters and a book. He has supervised more than fifty postdoctoral researchers and graduate students. He has organized and chaired numerous symposia and conference sessions including a symposium on Skrmions in July 2014 at Ningbo, China. Dr. Liu is the lead editor of Springer book “Nanoscale Magnetic Materials and Applications” (2009, among the top 20% most downloaded Springer text books). Zhi-dong Zhang received his B.S. degree in the department of Physics, Nanjing University and his Ph.D degree in the Institute of Metal Research (IMR), Chinese Academy of Sciences. He is a full Professor of IMR and the head of Magnetism and Magnetic Materials Division since 1995. Dr. Zhang has been engaged in research on the fields of magnetism and magnetic materials and also condensed matter physics, including in the light rare-earth giant magnetostrictive materials, the magnetic nanocapsules, the nanocomposite magnetic thin films, the magnetocaloric materials and the theoretical work on Bose-Einstein Condensates and superfluids. Recently, he focused his interest in topological structures in magnetic materials, such as vortex and skyrmion, and their dynamical behaviors and resonant excitations. He has published more than six hundred papers in international journals, including eleven invited review articles. Guoping Zhao received his B.S and the Ph.D. Degrees in Physics from the University of Science and Technology of China and National University of Singapore (NUS), respectively. He worked in NUS from 2000 to 2004. Since 2004, he has been a professor and distinguished professor in Sichuan Normal University (SICNU). Prof. Zhao is the leader of the Scientific Research Innovation Team for Physics and the founder and director of the Magnetic Materials Lab, SICNU. He is the author or the coauthor of more than 60 SCI papers published in international journals and referred conferences. Since 2006, Prof. Zhao has been invited as a visiting scientist to work in Singapore and Australia for eight times (25 months in total). He is an active researcher in fundamental issues in magnetism and magnetic materials including coercivity mechanism, magnetic domain structures (including Skyrmion) and exchange coupling.